So from my May2013 Ipsy Glambag (which I have reviewed recently here), I received the Yaby concealer in Vanilla, which is truly not my shade since I have never been that pale and have always been tanned (no matter how sunscreen and layers of clothing I have, my skin do not turn pale at all). I do wish sometimes my skin is lighter, but it'll never happen so let's move on! After watching the videos from Myra's page on Ipsy, it got me thinking to challenge myself! If those ladies made it work for them, why can't I?!? And why not add a new thing I will try to be doing once a week here in my blog which is my makeup either from the weekend or a night out! Not sure what to call it yet so I have called this one my "Weekend Makeup". A great excuse for me too, to play around with my palettes! 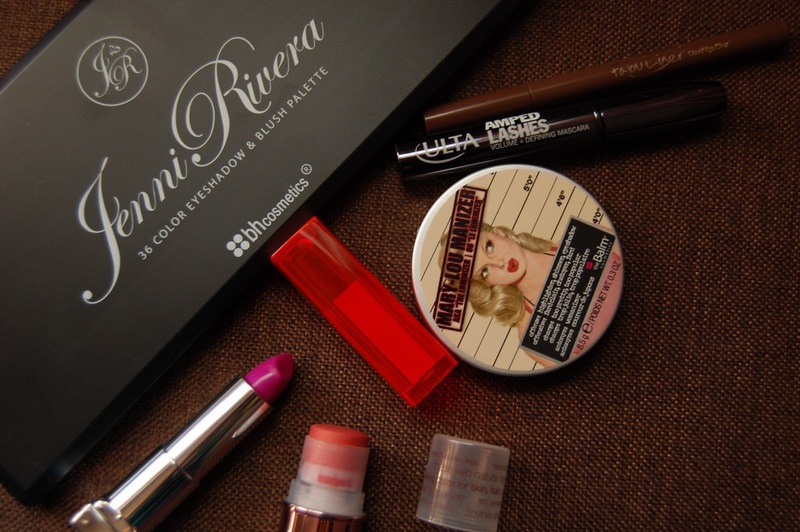 I recently bought the Jenni Rivera palette from BH Cosmetics, which I used with todays post. I will post a more in-depth review on that palette soon. 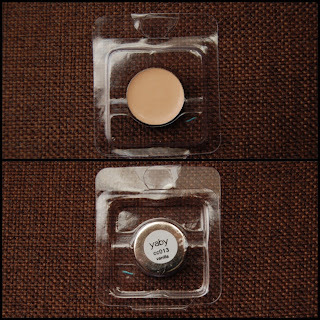 Back to the Yaby concealer, well this definitely blended well on my skin! Very creamy and not greasy on my face at all. I followed that "Kardashian highlight" map look but a little more subtler on me since I will not be facing tons of camera flashes outside my house! So under my eyes, I did that triangular shape, the bridge of my nose, by my chin and three lines on my forehead. It looks crazy before blending that I couldn't stop laughing at myself and the best pic I got is the one below. In the end, I can see how it brightened up my face where it needs to be and not looking like I wore three shades lighter of foundation! This is my first time using this technique and I am pretty amazed how it works out! I would not use this technique on my everyday face though since this just adds more time in the makeup routine, but I will definitely do this on special occasions like on date nights and on special events since it pictures well! *As long as you powder to mattify your T-zone area! Don't scroll down yet to see the finish product! Let me tell you what I did with my "Weekend Makeup"! Here are some of the products I used for the day. My hubby and I were just doing some errands that day so I kept it simple but very bright and Spring-y! For EYEBROWS: I filled in and defined with my Anastasia Eyebrow Pencil in Ebony. Then sealed it with Chella Clear Eyebrow Gel. For FACE: After blending my Yaby concealer, I used my BareMinerals Foundation in Golden Tan all over and then the BM Mineral Veil, to set everything in. For CHEEKS: I used my cream blush by Josie Maran Cheek/Lip Tint in Tenderheart, which has a soft peachy tone. For highlight I used my favorite from theBalm Mary-Lou Manizer on my cheekbones and below my eyebrows. For EYES: I used my new Jenni Rivera Palette from BH Cosmetics, I tried to do a subtle orange-y color on my eyes but the camera could not pick it up here. I did a pretty light application on it too, maybe that's why! Then Jordana Fabu Liner in brown to make my wing, since it's a daytime look. Black will be too dramatic so I used the brown one. *This liner is great! I love it! For mascara I have been using Ulta's Amped Lashes Volume + Defining Mascara in Black which I got as part of a gift bag with purchase a few weeks ago. This mascara is great for that natural looking lashes without the clumps or smears, and it kept my lashes curled all day! And now here's the final pic! With a before picture, well kinda, I have already primed my face before putting on the Yaby concealer here but you can see it actually does not look that scary light on my face! Overall, I love this highlighting technique! 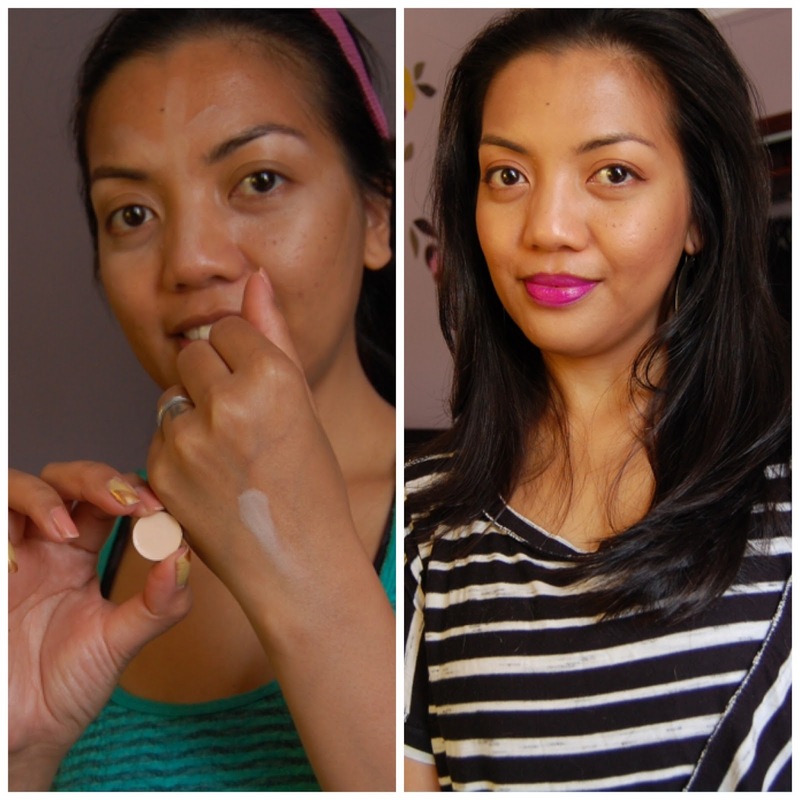 It has taught me to blend, blend, blend; highlight in the right areas and in the end a nice bright, lively face! I do need more practice. 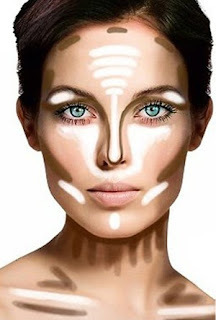 If you have anymore tips on how to highlight, please let me know and comment! Thanks guys for reading this! Love that lipstick on you, nice and bright and with the neutral eye it looks very nice.